I was so psyched to read this installment of the Once Upon a Time Series that I went so far as to preorder it. Besides the fact that I was interested to see how the series would present a non-european tale, I was very excited because I'd never really heard the story of Mulan (disney film excluded, of course). I started off loving it, but by the end....let's just say I was a bit disappointed.I have four main complaints:1) Mulan never truly meets a foe she can't face. Although she does encounter obstacles, she seems able to pass by them with little more than luck and determination. As a result, it seems that things "come easy" to her, which subtracts greatly from her heroic deeds. Although it is clear she works hard for her skills, the author's desire to show Mulan as a determined strong woman overrides the realism of the story. We do not see Mulan frustrated because she can't hit a target, and we never hear about Mulan falling off a horse. In fact, if she could just keep quiet, it would seem this Mulan could do no wrong.2) Because of the length of the book, important characters, such as Mulan's father, stepmother, her lover, or MOST importantly Prince Guang (who the author seemed to think was the main antagonist, despite the fact that he does NOTHING in the book) get almost no "screentime". Because of this, Mulan's "close" relationships with them seems forced, while relatively minor characters, (such as her childhood friend, Li Po) get a lot of mention, despite the fact that they play a minimal role in the story. 3) Part of the reason I read this series is because it presents me with a unique version of beloved fairy tales. My favorite books in the series are the ones that alter the "traditional" tale, either by changing the story itself (as is the case with Golden and The Crimson Thread), by placing the story in a non-traditional context (As Water Song did by taking the classic tale of The Frog Prince and setting the story in the middle of World War I), or by slightly altering an important aspect of or point of view in of the story. Perhaps this is just because I don't know the story well, but I felt that this version of Mulan had NONE of these qualities. Sure, there was a unique, independent, forward-thing heroine, but in every other way I assume this was a typical retelling of The Ballad of Mulan. So it seems to me that the very fact that it is not a european story makes it "unique" enough to be included in the collection. And although the story's origin DOES make it special, I don't think being ethnically different from the other tales in the collection makes this story a truly unique retelling. 4) The book itself seems very unbalanced, with the first 50 pages alone focusing on Mulan's early childhood. Although I am normally a huge fan of backstory, in a book of less than 200 pages, the author does not have the leisure of using 1/4 of the book's volume just to discuss the protagonist's childhood. This is especially frustrating in this tale because these 50 pages seem to suggest something horrible looming in Mulan's immediate future- but in actuality, the arrival of her father and new stepmother are ultimately POSITIVE changes. This, in and of itself would not necessarily ruin the book. However, the author adopts a rather leisurely pace, and so Mulan does not actually leave her home until page 112- leaving the heroine a mere 87 pages to establish herself as a soldier, meet the love of her life, worry about her hidden identity, experience camp life, see battle, fall in love, take down the Huns and save all of China. And yet, despite the small number of pages, the author manages to make Mulan's heroic deed and blossoming romance less interesting than the girl's quiet country childhood. I can't say I hated the book. It was cute, and I did enjoy Mulan's narration- as misleading as it was. I also liked the "asian flavor" this story brought to the series, although it still seemed very European to me. But due to poor planning, the novel managed to be short AND meandering, which is, in my opinion, quite a feat. Perhaps this was Dokey trying to adopt a more eastern style of writing, or perhaps she was merely trying to stretch out a very short story. Whatever the case may be, I can honestly say this was not my favorite installment of the Once Upon A Time Series. Still, if you liked the Disney film, or are a fan of the series as a whole, you may want to pick this retelling up. Now I am an "official" I guess you could say fan now. I've read a substantial amount of these books, and now I have to read them all. Dokey is the author that writes most of these retellings and for a good reason. She's excellent at setting the stage but for some reason at the climax you just want more, but I'm happy to report that this one felt totally satisfying.Here we have the story of Mulan. I thought that it was an interesting idea to put this in the fairy tale category. I wouldn't have thought of it myself but it does fit oddly enough. Unfortunately I don't have much background of the original tale. All my information prior to reading this book came from the Disney version. No worries it isn't a repeat and definitely gives the movie a run for its money.Mulan never has meet her mother or father. Her mother died in childbirth and her father is a a highly respected general in the Chinese army. General Hua is heart broken when he hears the awful news because he got to marry for love, which was unheard of. He just can't face his daughter until one day he has to. Mulan is not like any girl in China. This annoyed me a little because I mean China is a HUGE country with billions of people, not one of them could be like her? Really? That aside you do see that Mulan is one of a kind because she has this yearning to be herself. She can sew, embroider, shoot an arrow, ride a horse, read, write and wield a sword. And because of all her skills and passion she will become a true hero of China.This one is one of my favorites. Dokey captured the Chinese culture well. You sense how much respect they show for others and the importance of honor. Li Po (her childhood friend) teaches all she knows and I could see what was going to happen to him in the end. There is so much more action (not that much but a lot more than the others) and I appreciate that Mulan and Prince Jian are not physical knockouts but their characters are so bright. I loved it and that's all I can say without giving away too much. Hua Mulan's tale is renowned among my people. I am of Singaporean nationality and of Chinese race, and therefore it is a part of our culture and tradition. Where I grew up, every child will undoubtedly come to know of the fearless, brave female warrior who disguised herself as a boy and went to war in her father's place, ultimately saving all of China. Mulan's story is a gem, a diamond in the rough, especially in this patriarchal society where women are believed to be less capable than men. Yet there have not been many Mulan retellings. I would literally sell my soul for Mulan completely reimagined by a diverse author, bringing out key aspects of the tale while adding some unique touches. For this book I didn't exactly get the Mulan "retelling" I wanted - it was more of the exact story all over again. But then, I've already read one other retelling by Cameron Dokey, so I know her works are simple and follow the original tale word for word, and are perhaps targeted at a younger audience. Fortunately, this book was a quick read, which meant that the story didn't drag, preventing me from getting bored too easily. It's not a particular chore to get through it, nor is there anything remotely terrible about the book, but it's rather bland and has nothing special to make it stand out at all. I loved Mulan (the disney movie) as a kid, but I forgot how much until I read that book. I now remember why I loved it and now love it again.Smart and Brave Heroine: CHECKMulan has literally virtue that I admire: bravery, strength, I love that she isn't afraid to be different or to be herself. She just wishes she could be herself without disgracing her family or her warrior father. She is so brave and strong. She is one of my favorite Heroines now.Sweet and Brave Hero: CHECKEven though he's not the romantic lead, Li Po is so much of a hero! He risks everything he has to win honor for his family and to show his true face. In the end he (view spoiler)[ ends up paying the ultimate price, his life. (hide spoiler)] Now on to Prince Jian, he was fantastic and brave and smart and cute and so much more! Original Setting and Unique Plot: CHECKSure, the basic plot was the same, but I am more than willing to overlook that because of the amount of depth and emotion that Cameron Dokey was able to add to the story. And the characters were all fantastic.Extraordinary Supporting Characters: CHECKYES. YES. YES. Li Po, Zao Xing, Min Xian! I loved them all, each and every one. They all portrayed such beautiful emotion and great character.Plot Twists and Page Turners: CHECKNot that many plot twists, but can you really expect than from a retelling of an old story already known by most? Not really. As for page turners, the writing is what inspired me to keep reading. It was beautiful and fantastic!All together an amazing read and recommended! Cameron Dokey never fails to get her point across. I love the Disney movie Mulan so I had no doubt that I wouldn't at least like this book. I'm getting used to these short books. Mulan is a great protagonist. She is different from other girls and longs to be taught something other than embroidering and being a proper young girl. So she learns (from her neighbor and friend)to read, shot arrows, sword fight, etc. Basically what boys are supposed to be learning, not girls. The only downside to this is that you keep on being reminded how great Mulan is. She is different, therefore special and you are reminded of this every other page or so. It got a bit tiresome and I think I could've still gotten the message even if Dokey only mentioned it half as much. The first half of the book was a bit slow. I was expecting Mulan to set out on her adventure after a quarter of the book was though but it was almost halfway before she left home. I guess it was so you could see the relationship between all the characters develop so I wasn't too bothered by it. Another thing was that there was one part of the book were I didn't think that Mulan was sad enough. She was sad but -in my opinion- not enough. I won't say what it is because it'll probably give away too much. I know I'm mostly writing what I didn't like but I did really like this book. I think it was the story in general that I liked so much. It was different from the Disney version but I still like this version too. So if you like the tale of Mulan then I say read it. Prior to reading Wild Orchid, my only exposure to the story of Mulan was through the animated Disney film (which I haven’t seen since its release about ten years ago). It’s refreshing to see the Once Upon a Time series expand its boundaries from the traditional European folk & fairy tale canon. While Dokey’s fairy tale heroines tend to be somewhat similar – they want to follow their hearts and develop their own identities in spite of forces arrayed against them – Mulan’s story stands out because of the historical backdrop against which the tale is set. The expectations (both direct and unspoken) placed on Mulan as the daughter of a famous general, particularly in a society that places such emphasis on sons, gives this story an entirely different “feel” from Dokey’s other fairy tale retellings. This tale is also a shade darker than the other retellings in the series due to the war-time theme of the story. Despite the novel's short length, Dokey makes the most of it and in Mulan creates one of her strongest and most well-developed heroines. And though Jian doesn't appear until Mulan goes off to war, the relationship that develops between him & Mulan is pretty well-grounded. Wild Orchid is another solid Dokey-penned retelling, and injects some fresh life into the fairy tale series by shedding light on Chinese legends & culture. The story of a warriorI love the story of Mulan. It's such a beautiful tale of honor, courage, and strength. Fairy Tale retellings are my favorite things to read and Mulan is a story that isn't often retold so having the opportunity to read it was awesome. The writing was ok. If I'm being honest I wasn't the biggest fan of it. I didn't really like the whole recounting old events. I guess it gave it more of a fairy tale feel, but still I wasn't the biggest fan. Having read a lot of fairy tales, I get a little picky about the way they are told and reimagined. The plot was good but way too slow in the beginning and way to fast at the end. It didn't give enough time for relationships to develop and empathy for the characters to grow. When stuff happened, I felt distant from the characters. I didn't feel their emotions like I had hoped. It felt like it was just a bedtime story, the ones that help you sleep at night because they force no crazy emotions out of you. Plus, I felt like it took way too long to get to the actual base of the story: the war. You didn't get there till over half way through the book. To top it off the actual time she spent as a boy was barely a third of the book and her rescue of China happened way to fast. I would've liked more development, more time spent on Mulan's struggle to hide herself. The characters were nice but not complicated. There was no depth to them. They felt 2d rather than 3d. I didn't get attached to them and for me that was a real shame. I recommend this book to those who love a nice simple fairy tale and Mulan. Enjoy! Reviewed by Jennifer Rummel for TeensReadToo.comMulan's mother died during labor. Her father, a great General in the army, was heartbroken. He's never been home since he heard the news. Thus, Mulan lost both her parents on the same day.Mulan is not your typical girl. Instead, she climbs trees and despises needlework. She meets the boy next door and the two of them form a friendship. He teaches her archery, how to ride a horse, how to use a sword, and, finally, how to read and write.When her father comes home, everything changes. First, she must learn how to trust and obey him. Second, she must learn how to love him and her new stepmother. Just when she's finally found herself a new family, the Huns appear on the horizon of China. The men are called back to war.Mulan, unwilling to let her father go with a bad leg and a new family, disguises herself and takes his place instead. Her first day there, she catches the ears of one of the king's sons. He engages her in an archery contest. From then on, Mulan is famous throughout the camp.With the Huns quickly approaching, all three princes have different ideas on how to defend China. Mulan mistakenly speaks out during a strategizing session. Prince Jian immediately seizes her idea. But will it be enough to save China?This new ONCE UPON A TIME addition weaves together the wonders of ancient China, a budding romance, a feisty girl, and the true meaning of both friendship and family in a fantastic fairy tale edition. Fun, quick read. I'm always happy with a happy love story ending as well. I do have to say that I think they could have gotten a more oriental looking girl to model for the cover. I'm annoyed by the girl every time I look at the cover. Young Hua Mulan has never met her parents. Her mother died giving birth to her only child, and her father left to war shortly after, too pained at the sight of the cause of his beloved wife's death (a daughter, no less) to remain. Raised by the same nurse who watched over her mother, Mulan wants nothing more than to be allowed to be herself and engage in her own interests -- not suffer through wearying weaving and endless embroidery, but learn to ride, shoot, read and write with her friend, a boy named Li Po from a nearby household. (Though of course her secret and deepest desire is to learn more of her mother and earn her father's respect and affection.) When the great General returns unexpectedly from the battlefield, Mulan is put to the test in more ways than one, and only hopes she can fulfill her hopes and dreams.Full disclosure: This book isn't my usual fare, and it definitely wasn't written for me. (Even typing out that synopsis makes me feel a little silly about having read it.) But, when looking up books about Mulan for my Disney source material read-through, this one came up, and I thought (before realizing that it was part of the Once Upon a Time series...) that it would be fun to read a novelized retelling of this story, and it actually wasn't the worst. It wasn't totally original or compelling literature, but the writing wasn't offensive and the storytelling clipped along just fine. It was kind of shallow and tried for a lot more artistry than it actually accomplished, but it was harmless. They made Mulan into a little more of a tomboy than I like (the whole point of her going to war is that it's totally out of her comfort zone), but I liked Li Po and the relationship between Mulan and her father. I think it felt a little too long (oh, the introspection...), and at one point I wondered if she even would go to war in this version, there just didn't seem to be many signs even as far as halfway through, which means that, yes, the war part seemed a little tacked on and rushed, especially considering it's supposed to introduce the potential soulmate and all, but it checked all the boxes and I'm sure was just enough war and battle drama for those who typically read this genre.This book thought it was really deep, and while it wasn't, it was still harmless fluff. It's a loose adaptation of the legend of Mulan, and it has some modern sensibilities infused in (Middle Ages for the modern reader, I guess), but it also actually has some nice touches of authenticity here and there. It wasn't offensive as literature but it's definitely not my thing. This is my first, and probably last foray into this Once Upon a Time series, but if I had to read one in my lifetime, I have a feeling this was probably an okay one to read. Mulan's mother died in childbirth, leaving her father heart-broken. He can't bring himself to come home from the battlefield and visit the child who cost his beloved wife her life. When he finally does return home after the emperor dismisses him, he finds Mulan a young teen who very much has a mind of her own. She is a brilliant, talented girl. Her best friend Li Po teaches her to read and write and shoot a bow and arrow. Her caretaker teaches her embroidery. Of course there are bumps along the way as Mulan and her father get to know each other for the first time. But when the Emperor summons his men to fight the Huns, Mulan knows that she can't let her injured father go fight as a regular soldier. Those archery lessons just might come in handy after all. This was a decent book, but I have a couple of complaints. I was excited to read a non-Western fairy tale re-telling. And while I did enjoy the story, and I really liked Mulan herself, this book stayed a little too faithful to what I know of the legend from the Disney movie. I enjoy re-tellings that add an unusual twist to the story, or develop characters more fully. I don't really feel like I got that here. Mulan was pretty well-developed, but I can't say the same for any of the other characters. There are two separate love stories, and I have to say that I was surprised by both. Sure, I knew they were going to happen, but it was just sort of like they met and they were in love. There was no buildup to it. Also, the ending felt a bit rushed. I don't know what could have been done to change that, but I read the big crashing climax and was left thinking, "That's it? All this build up for that? "Those complaints aside, I did like Mulan a lot. I wouldn't call myself a tomboy, but neither can I imagine mindlessly embroidering my life away. I wouldn't have the guts to do what Mulan did though, and I admire her for doing it. It's always fun to read about characters who do what you can only dream of. I'm being harder on this than I really intended to be. It wasn't bad, I just think that it could have been better. As it is, I'll probably quickly forget that I ever read it. If you don't mind such a straight-forward telling of the story, you will probably enjoy this one. The one star is prolly due to my expectations, of which this book has fallen sorely short of. I like fairy tale retellings as much as the next fantasy fan, but i think Cameron Dokey has some of the best retellings out there. What i appreciate most from her writings are her ability to inculcate insight into her stories. However though insight was present in the Wild Orchid, i felt that more depth into Mulan's story was sorely lacking. My main problems with her book invovled the story of Mulan. I know the story of Mulan and her story took place in a war which lasted years and years. Also, i had a hard time visualizing her as this little girl of just 14 years old going into war and training to fight in it. Plus the pacing was off for me -the beginning was pretty dragging but the final chapters took place so fast that i didn't really feel the unfolding of the development of the story. All in all, it was a disappointing read for me. Okay, so I'm on a Cameron Dokey kick right now. Probably because I need to escape into a bit of fairy tale fantasy and probably because they're a quick read so I can handle it time wise. I enjoyed this retelling of Mulan. It was a nice change of pace to get away from all the European based fairy tales and read something set in China. It makes you want to be brave and go out riding your horse while wielding your bow and arrow. I wish there had been a little more development between her and her love interest, but what can you do with a somewhat short book. I enjoyed the development of the relationship between her and her father. I wish I could give half stars, I would give this 3 and a half. 2.5 Stars. This was the second installment in the Once Upon A Time series (the other in that capacity The World Above) and both by Cameron Dokey, who writing I like. In total it's a fine book, I've not read or watched in other interpretations of Mulan, but from what I've seen it seems like it does justice. . . I wouldn't be that authority though!My biggest and only gripe was this: DID MULAN HAVE TO END UP WITH JIAN FOR HEAVEN'S SAKE? It's supposedly set in the Sui Dynasty of China, if you're judging the original legend, which was 581-618. It made me feel like writing fairy tale retelling myself, those inclusive of a damsel who lives happily ever after as a spinster. More of a 3.75I thought I would give this book a higher rating but I just couldn't. I found the beginning of the book very slow paced. It took about 115 pages for Mulan to actually leave home. I was hoping the story would pick up quicker, but it didn't. Then when the story did start to pick up, it was over. I enjoyed the book but that's pretty much it. I liked the last 70 pages that's why it got the .75 otherwise it would have just been a 3 star book. I will continue with the Once Upon a Time series, I hope some of them are better. 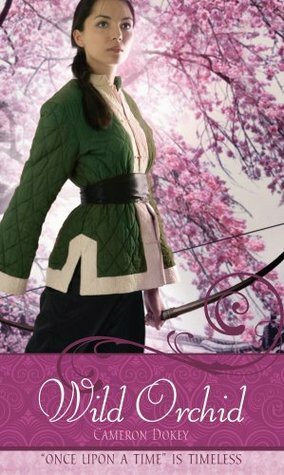 I quite enjoyed this installment in the "Once Upon A Time" series, even though Mulan's story is not actually a fairytale. I have never read the original legend of Mulan, so my only knowledge of the story comes from many viewings of Disney's animated film version.Many have complained about how much time is spent on the beginning of the book on Mulan's childhood, but I actually liked getting to really know Mulan before she goes off and does her heroic deed. Then again, the ending seemed incredibly short in comparision, so there is a feeling of imbalance which is a little dissatisfying. Very good young adult novel. I wish the cover photo (on the copy I read) showed a girl more tom-boyish in looks and figure. The photo shown focuses on features too fine and lovely to ever be mistaken for a boy. I'm thinking of Gwendolin Christie, who plays Brienne of Tarth on "Game of Thrones." Let's see a photo like that. A beautiful, strong, but unconventional looking girl who we might believe could wield a man's bow and lead out convincingly as a male in battle. My favorite one so far! Loved it, stayed up late to finish it. I loved this part in chapter 3 "All of us hold something unexpected deep within ourselves. Something even we may not suspect or recognize. While our heart's rhythm may seem steady, so steady that we take it for granted, this does not mean the heart is not also full of wonders and surprises. That it beats in the first place may be the most surprisingly wonderful thing of all." With a strong and noble main character, this short story relates the tale of Mulan. Many secrets are related throughout the course of the book, and the reader truly sympathizes with the characters' plights and joys. I thought the inclusion of Li Po was good but ultimately it focused too much on Mulan's life before she went off to war and not enough on the action. Not the most elaborate or exciting among retellings but very nice writing and rhythm. A more conventional retelling, I believe. If I were to describe it in one word I'd say: dry.It wasn't very interesting or fast-paced or anything really. I was disappointed because "Mulan" was one of my favourite movies when I was a kid and I kind of expected this book to be at least a bit exciting. Unfortunately it was not. It didn't move me. If I were still a kid I wouldn't get anything out of it. In the movie Mulan wasn't very strong or smart or rich but she WAS determined and she WAS brave and so she DID face her fears and weaknesses. This one though was a bit of a bland whiz kid who could do anything🙄. As for the "action" ( last 20 pages or so because most of the book is about Mulan being a girl 😱 and her feelings about her father😴) -it wasn't exciting, heroine's plan wasn't brilliant, her friend died practicaly right away and the whole "great battle" took about 3 minutes. So yeah...as I said - dry, no emotion whatsoever. I just loved this book. It was perfectly wonderful. I enjoyed how different it was from the original movie, and how all the names and how the whole context was different. I recommend it on a very high level. It was not the best story I have ever read, but it was very enjoyable while it lasted, and I actually yearned to keep reading it when I had to put it down and do other things. I guess that is a good sign of a good, and great book.If you want to see a new, and completely amazing, perspective on "The Ballad of Mulan", then pick up this book. You'll never want to put it down until its finished, and then you'll probably find your way onto this website to express your opinion. Good for you!